Built by Mondo Marine with delivery in 2000, she was designed by Aldo Cichero and had an extensive refit in 2010 to create a modern, stylish interior while a stabilised satellite television antenna and controller system was also installed. The saloon has comfortable lounging areas and a large flat screen television with surround sound and DVD. The flybridge is the largest of a yacht in this size range and has sun pads, a massive table for al fresco dining for eight guests and a bar, making it an ideal place for outdoor entertaining. Accommodation is for up to 10 guests in four cabins, including a master suite, a double suite and two twin cabins, the latter each with an additional Pullman berth. All cabins are en suite and fitted with entertainment systems. There is also Wi-Fi internet access throughout Talila, and twin MTU 16V 2000 M90 engines give her a cruising speed of 25 knots and maximum speed of 28 knots. 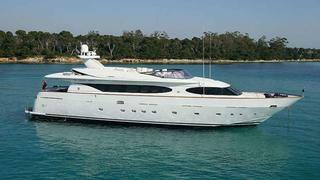 Lying in Monaco, _Talila _is now asking €1,350,000.